NJSGC Needs Your Help & Support for FY 2019! Please accept our sincerest appreciation for your past support of Sea Grant and New Jersey Sea Grant Consortium. Last year, you reached out and told your elected officials how important Sea Grant is to you, our state, and the nation. You were most definitely heard. Congress soundly rejected the Administration’s proposal to eliminate all Sea Grant programs. This allowed us to continue to work with you on so many crucial issues including stormwater management, coastal resilience, supporting the shore tourism and boating industries, and providing environmental and STEM educational experiences for children, college students, and the public. The Administration recently released its FY 2019 budget blueprint. Once again, it proposes the termination of the entire Sea Grant program and so, once again, we must ask for your help. Please reach out to your elected officials as soon as possible to ask for their renewed support of the Sea Grant program. 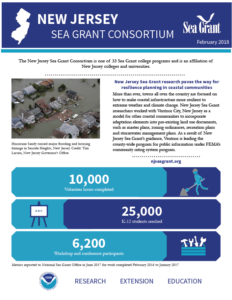 When you write or call your elected representatives, it is important to thank them for their past support and remind them why the Sea Grant program is crucial to New Jersey’s well-being and how our work has benefited you personally. To help you develop your message, we have included a template for possible use in composing your message. To further assist you, this directory includes each of New Jersey’s elected officials, including email addresses for their aides. If you decide to write, please direct your letters to local offices (not DC). If you decide to call or fax, it is best to call both the local and Washington D.C. offices. If you decide to email, please write your message to your elected official, but use the email address provided in the directory for his or her aide. You can also locate your Senators and Representatives at https://callyourrep.co/ or text your home address to 520-200-2223 and you will receive a message containing the names and phone numbers of your representatives. 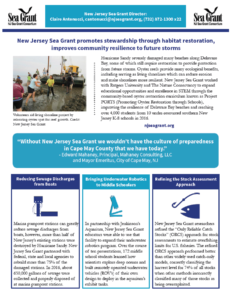 As an additional guide, please take a look at NJSGC’s year-in-review fact sheet developed by NOAA, and feel free to share! We are forever grateful for your support and it is our pleasure to serve you.